It should be easy to kill a little flea, but the flea is a resilient little creature. Over-the-counter flea fighters are available in many forms, but many are not terribly effective. Consider consulting with your vet for a flea medication that's fast, effective and safe for your cat before you choose an over-the-counter solution. If you rely on flea shampoo to control your cat's fleas, she'll require regular baths. It's not necessarily the simplest method -- especially if you have a cat -- but regular baths can protect your pet against fleas. You'll need a medicated shampoo formulated to kill the fleas already on your pet. When you bathe your pet, follow the directions, leaving the shampoo on as long as indicated to ensure the shampoo has done its work. Though this is a fairly inexpensive way to kill fleas, it's labor intensive -- it usually means bathing your cat at least twice a month for proper flea control. Flea shampoos can be harsh on a pet's skin. 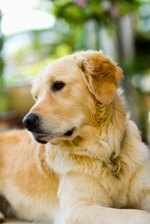 They can't keep fleas from reinfesting your dog or cat. The flea collars is an old standby over-the-counter method of keeping fleas away. However, their effectiveness can vary widely, often depending on how many fleas are in the environment and on whether the product is used properly. The collar must make contact with the animal's skin to work -- the chemicals need to transfer from the collar to the cat's fur and skin. Collars are often effective at killing fleas around the cat's neck but are less effective on eliminating them further down the body. Powders and sprays are readily available and fairly inexpensive; however, these repellents require caution. Both can be irritating for you and your pet if inhaled. As well, they can be harmful to the eyes and may dry out the cat's coat. They tend to wear off quicker than spot-on treatments and usually kill only adult fleas, so they need to be reapplied when you see signs of flea activity. Fleas are industrious when it comes to procreating -- one female can lay up to 50 eggs in one day, and those eggs can end up anywhere and everywhere as they slide off your pet into your rugs, chairs and bedding. If you have a flea infestation, thorough cleaning is a must, including daily vacuuming and weekly bedding laundering. Even the most vigorous housecleaning needs a little assistance when fleas are at hand, often in the form of a flea spray or fogger. You'll need to clear everyone -- people and pets -- out of the house. When you're shopping for an over-the-counter home treatment, look for a spray that has pyriproxyfen or methoprene. If chemicals are a no-go for you, try a natural citrus spray, which repels fleas. Remember: if you go to the trouble of eradicating fleas in your home, it will have been for nothing if you don't use a preventive treatment on your pets, as they are ideal hosts for fleas, inside and out. Topical flea preventives can effectively keep your cat flea-free, but if you're buying an over-the-counter medication, proceed carefully. Previously, over-the-counter topical products weren't reliably effective and also contained chemicals considered toxic to cats, including permethrin, which can be deadly for cats. Two formerly prescription-only topicals, Bayer's Advantage and Merial's Frontline, are now available without a prescription. The Pet Doctor website and the Hancock Park Veterinary Clinic website both recommend these over-the-counter topical treatments as safe and effective for cats. If you elect to go with an over-the-counter flea treatment for your cat, read the packaging carefully and avoid anything that has permethrin. Never use a flea control product manufactured for a dog on a cat. If you want to use an over-the-counter flea treatment for your cat, run your choice by the vet to make sure it's safe for your cat.